Basically, customers want to know what we're doing with the cloud, but often when they say this, they are talking about private clouds. The tendency is that people that want to run a private cloud themselves with Cinegy software on top are looking in turn to offer services to their clients. The reason being that they want the ability to dynamically scale up and down their systems to respond to their client requests. It tends to be the bigger players in the industry that want to go with a private cloud system, especially in world regions that provide many channels in multiple languages for ethnically diverse audiences. They want to go with a private cloud because it enables them to address those audiences without major investments in hardware. 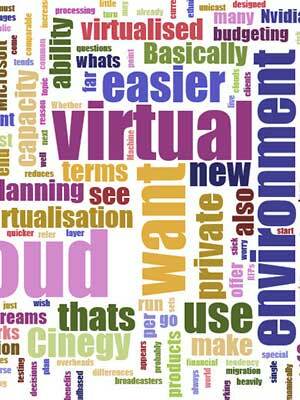 I should probably point out that the terms cloud and virtualised environment are basically interchangeable. It just depends on how you want to refer to it, but in the end, you can't have one without the other. For our purposes, we'll stick with virtualised environment, which is where a broadcaster prefers an environment where they still run a data centre and hardware, but with a virtual layer on top to make their service offerings easier to manage. The benefit to them is that it reduces administrative overheads and provides the ability to respond much quicker to changes in broadcast requirements. They can spin up or spin down a channel whenever they wish for news, special event or sport-related requirements with next to no financial risk. This also makes capacity planning easier because they can increase or reduce capacity very easily without having to be concerned about planning and budgeting for, say, five new physical servers for a single new channel. In a virtualised environment those concerns are all but irrelevant. In short, the trends for capacity requirements are much easier to see, plan for, and respond to. It's also far easier to see what's happening to an entire system with the centralised management tools you get with virtual environments. Whether you have vCentre for VMware or Microsoft Virtual Machine Manager you can readily see your overall resource utilisation and many other operating environment parameters. For most systems, in terms of features such as the live migration of virtual machines and shared storage utilisation, the different approaches on offer are now very comparable. The differences come when you start looking at cost. Microsoft Server 2016 charges per processing core - rather than per processor as VMware still is. That's where a decision may end up being less dependent on feature sets and more on licensing costs, but of course those are individual decisions based on individual requirements. Basically, a lot of your decision will be based on what you already have in house, coupled with what you want to achieve and at what cost. Although Cinegy software is currently Windows-based, we're essentially virtualisation platform agnostic and are always looking at ways we can be even more so. Our software does not worry about what hypervisor they are running on. However, for broadcasters that use Cinegy software, what does make a difference is that we make great use of Nvidia graphics cards. The physical host running your virtualisation software needs Nvidia graphics cards, which can then expose through itself your guest operating systems. One of the challenges of public cloud-based networks is that you can't use multicast, which is heavily used for IP-based broadcast. You must use unicast streams to get between the virtual instances, and that's because of the way the networks are designed. They use software-defined networking, which has benefits, and some limitations. But the advantages of what's possible in the cloud far outweigh the limitations. The ability to prototype and test new things in the cloud is almost unlimited, and it costs very little to do. We're developing, testing, and will eventually be bringing to market some very cool products that we could not otherwise imagine. The bottom line in a virtual environment is that there is enormous room for innovation. You can try out new products and services for the tiniest fraction of what it would cost to develop, build - or fail - in-house. And that's because cost of entry into the cloud is very low, as opposed to the budgeting, planning, building and installation of steel boxes. You can get in and out of the cloud much easier, either for a few quid or often on a small scale, for free. After all, that's where virtual dreams are made.